A 2-day workshop introduced the teachers to the Just Play philosophy of positively supporting the growth of young children through active participation in football. The workshop took the teachers through the concepts, delivery and goals of Just Play and the handing over of their certificates this afternoon was the culmination of a very successful 2 days. Smiles and cheers of celebration marked the end of the program as the participants were awarded their certificates and given the tools in the form of football training packs to use in their respective schools. The equipment packs contained bibs, balls, cones and markers as well as training manuals. What now lies ahead for the teachers is a 6-week implementation program in which they will use the Just Play training manual to organise training lessons for their students. This was described to the participants as difficult period but one that is filled with the opportunity to touch lives and make a difference in their schools and communities. Participant, Joe Frazer, who is a teacher and sports master at Betivatu Primary School says that Just Play will change football development in Solomon Islands. “After completing this workshop I can see that Just Play will boost football in Solomon Islands and I believe that 5 to 10 years down the line we will be more competitive in the region and also in the world,” Frazer says. Oceania Football Confederation (OFC) women’s development officer, Emmie Sope, who was one of the instructors during the workshop told the participants that Just Play gives them another channel to interact with their students but a greater opportunity is bundled along with it as well. “Maybe one day one of your students will become the prime minister of this country or become one of the players in the national team. The good things from this program will come ahead in the future and as teachers you must take ownership of Just Play,” Ms. Sope said. President of Guadalcanal Football Association (GFA) Patrick Miniti was among guests at the closing ceremony and he thanked the authorities responsible for taking Just Play to his province while challenging the teachers to use the program for its worth. “Just Play will help children to participate in sports, in this case football, and this assist them to be active young men and women when they grow up. The challenge is for you to actually take this program to your schools and make use of its potential,” Miniti says. Just Play has already been introduced to Honiara, Western and Malaita. Guadalcanal is the fourth province in line and further launches will follow in the remaining provinces of country including Isabel, Makira, Temotu and Rennel Bellona. 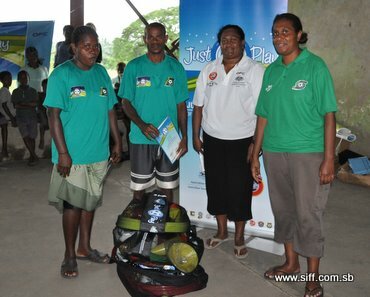 Just Play is also active in Papua New Guinea, Vanuatu and Tonga amongst other pacific island countries. It is one of OFC’s major social development programs and it is aimed at using football development as a tool for targeting issues affecting island communities. It is funded by the Australian government through the Australian Agency for International Aid (AusAID).